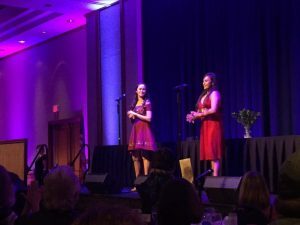 Kennedy Theatre Productions as well as individual UHM Theatre faculty and students were honored with awards for excellence at the 2017-2018 Season Po’okela Awards on Monday, August 6th at a gala which took place at Koʻolau Ballrooms & Conference Center in Kaneohe. The formal event included a full buffet dinner and featured live musical performances from some of the star-studded theatre productions seen around the state this year. Masters of Ceremony were Keoki Kerr and Jodi Leong. The Poʻokela Awards have recognized excellence in local theatre since 1984. Under the Poʻokela Awards adjudication process, a panel of three adjudicators selects honorees in twenty-three different theatre arts categories spanning: producing, directing, performing, design, and technical theatre. Awards are given for excellence in each category. The adjudicators may also recognize excellence outside these categories through discretionary awards. Several member theatres provided live performances during the gala, including: Chaminade University Performing Arts with “Green Finch and Linnet Bird/Ah, Miss” from Sweeney Todd, performed by Riley Noland and Gabriel Giasolli and accompanied by Linda Asahina; Kumu Kahua Theatre with “The View of a Kupuna and Missile Threat” from 38 Minutes performed by Wally Wake and Ruby O’Malley; TAG- The Actors Group with “Rockin Jerusalem” from Choir Boy and performed by: Jarren Amain, Darian Aquino, Sam Tafolo; UHM Kennedy Theatre with “The Colors of Paradise” from The Spitfire Grill, performed by Jorin Young and Rachael Uyeno and accompanied by Ike Webster; Manoa Valley Theatre with “Ring of Keys” from Fun Home performed by Ember Isabello; Diamond Head Theatre with “Better with a Man” from A Gentleman’s Guide to Love and Murder performed by Garrett Hols and Zachary Linnert and accompanied by Darcie Yoshinaga; and finally Paliku Theatre with “Hello Young Lovers” from The King and I, performed by Kathleen Stuart. Hawaiʻi State Theatre Council was created in 1970 and has been serving Hawaiʻi’s theatre community by promoting excellence in live theatre and facilitating theatre collaboration ever since. Participating theatres include All The World’s A Stage, Aloha Performing Arts Company, Chaminade University Performing Arts, Diamond Head Theatre, EPOCH, Hawaiian Mission Houses, Hawaiʻi, Shakespeare Festival, Honolulu Theatre for Youth, Kumu Kahua Theatre, Manoa Valley Theatre, Maui OnStage, Mid-Pacific Theatre Program, Paliku Theatre, PlayBuilders of Hawaiʻi Theatre Company, TAG – The Actors’ Group, Leeward Theatre, University of Hawaiʻi at Mānoa, and Windward Readers’ Theatre.